Now is the time to find out how much you West Ham United fans really know, but be warned your brains are sure to take a hammering as you struggle to answer the 1,000 challenging questions in this quiz book, covering every aspect of the team’s history, such as players, managers, opponents, scores, transfers, nationalities and every competition you can think of. You’ll be arguing with the referee and pleading for extra time as the questions spark recollections and ardent discussions of the legendary greats and nail-biting matches that have shaped the club over the years. 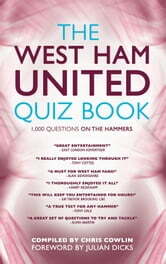 With a fitting foreword by Hammers legend Julian Dicks, and bulging with important facts and figures, this book will entertain as well as educate, but be prepared for a few fouls and yellow cards along the way.